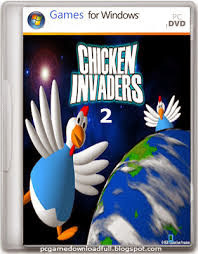 CHICKEN INVADERS 2: THE NEXT WAVE is the second release of the series chicken invaders game. The theme of the game is same as was in previous part. The aim is to eliminate the chickens and save the solar system from their attacks. The eleven level of the game each of which consists of 10 waves of attacking hostles is the best feature game. The chicken invaders 2 you will faced the chikens attacking you with eggs and your task is to dodged them and destroy the chickens. Initially you will have the basic weapons but you can upgrade your weapons. There are eleven level of upgradding your weapons in chicken invaders 2 game. On the completion of each level you will get a weapon and on the successful completion of level nine you will a bonus award if you dont use missile throughout the ninth level. 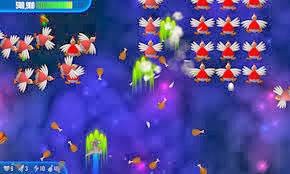 Another version of chicken invaders 2: Christmas Edition has also been released by the interaction studio. This is very best game for kid to play and hopefully kids and children will really like this version of the chicken invaders game.